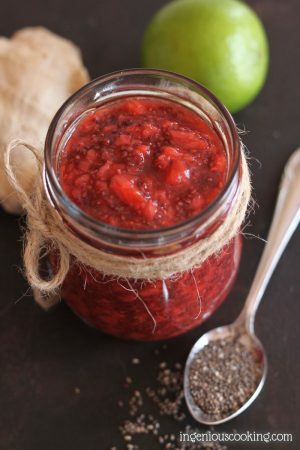 Strawberry chia chutney with lime & ginger: spicy and sweet with the right amount of sweetness - with no added sugar and almost no cooking! Clean and half strawberries. Peel and dice the lime. Put fruits in a food processor and pulse a couple of time - not too much, they should be chunky! Pour fruits in a small sauce pan and add all spices and some water (level of water should almost reach the top pf the berries). Heat over medium heat until it starts to boil: take off heat, add chia seeds and mix well. Taste check for spices, sweeten, if needed and let it set overnight. You can eat this chutney fresh or you may also can it for later.